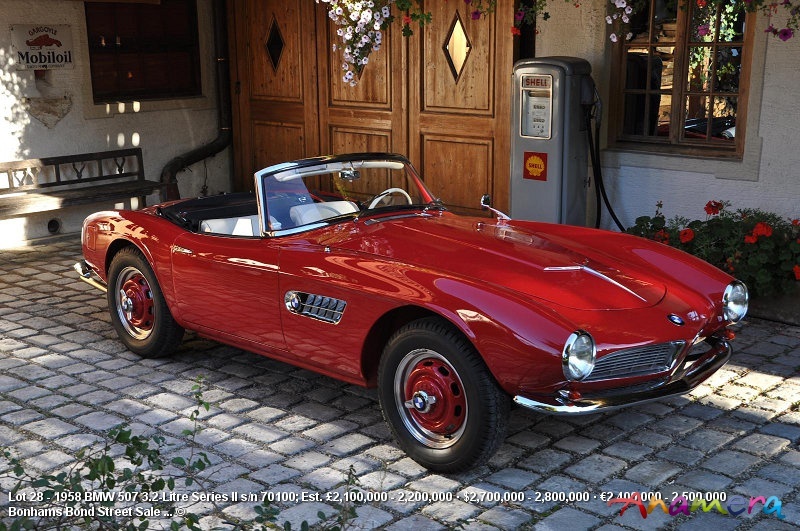 The BMW 507 owned by the designer of this legendary model, Count Albrecht Graf von Goertz, is to be offered at Bonhams annual Bond Street Sale on 1 December. The 1958 Series II example is one of only 252 built and is expected to achieve between £2,100,000 and £2,200,000. The model is recognized as one of the most elegant cars ever created and was BMW's answer to the 300SL from its rival marque, Mercedes-Benz. The 507 was driven by some of the biggest stars and influential leaders of the time, including Elvis Presley, John Surtees, Ursula Andress, Prince Rainier of Monaco and the Aga Khan. This example was bought by Count Albrecht Graf von Goertz, a German designer living in New York who had designed everything from furniture to fountain pens - but never a car. The 507 was his first automotive design, and was met with great acclaim. It was bought by von Goertz in 1971 and he owned it for more than a decade. It was extensively restored in 1990 and is in excellent condition.